This interview is the second in a series of exchanges with local elite runners. These are the guys and women who train hard, take their running seriously, and work to compete--and win--on a local and national level. For all of these folks, running is a hobby. None of them make a living doing it. They continue to represent the best of amateurism, the idea that excellence in athletic endeavor is valuable for many reasons beyond financial compensation. Jamey Gifford and I trained together every day back in the "glory days" at Baylor High School in Chattanooga, TN. We were a part of back to back state championships. Jamey is one of the greatest high school runners in state history, and he made his mark on the national level. My memories of Jamey, though, have less to do with racing and more to do with the daily hammerfests around the Baylor campus during which we each honed our competitive spirits. Coach Hale gave up on trying to hold us back and just let us go. Before we knew what a "progressive tempo run" was, we executed them day in and day out, half as a training exercise, and half just because neither of us wanted to give an inch. And those were our "easy" days! It occurs to me now that those easy days were probably easier for Jamey than for me! At any rate, I asked Jamey to write this interview because years later I realize that I learned a great deal about how to run out there, hammering away as a teenager. Those lessons were mute, but Jamey does a great job of putting his take on running into words here, giving his thoughts on what it takes to win an individual state championship, how to break through in racing, what it's like to train with Olympians, and how his religion informs his running. Enjoy! LLD: What are some of your "career highlights" and performances you are most proud of? JG: Back in high school at the Baylor School in Chattanooga, I won 5 state championships (2 in cross country, 3 in track), had two Footlocker National XC top 10 finishes (8th in 1995, 10th in 1996), and ranked in the top 10 nationally in the 1600 (4:09) and 3200 (9:04). 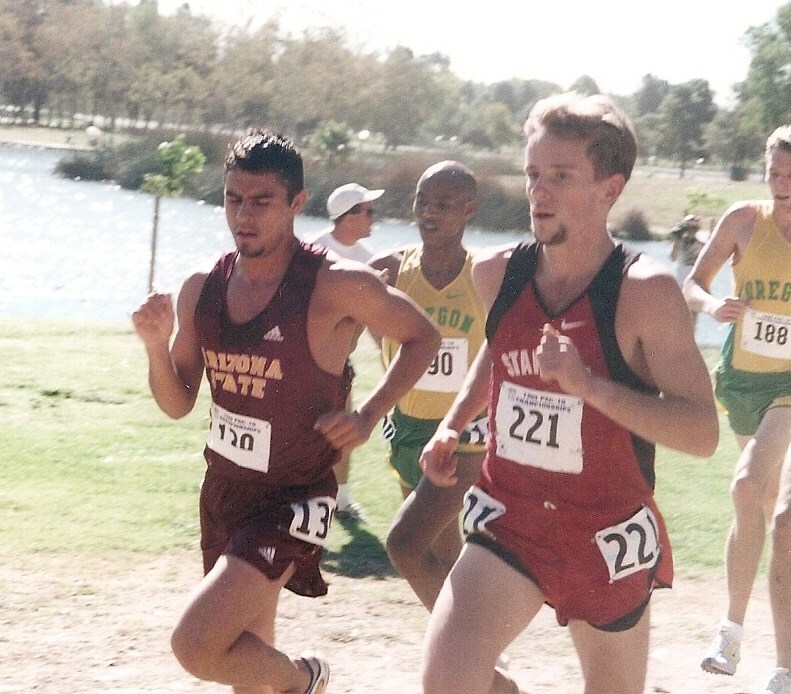 I went on to Stanford to run collegiately, where I experienced a lot of ups and downs. I rebounded from a tumultuous freshman year to run on Stanford’s NCAA XC nationals squad my sophomore and junior year with a best finish of 62nd. My junior year I ran my PRs of 3:50 & 14:35 for 1500 & 5000 meters. Then at the end of my junior year, a string of injuries derailed my college career as I never regained a fitness level close to where I was before. After college I hung up the spikes for several years. Then just before I turned 30, I started running consistently again, which turned into actual training, and now I’m racing fairly frequently. The first would be the Footlocker National XC meet my junior year. My goal had been just to qualify (I was the 7th out of 8 qualifiers from the South regional). At nationals I was literally nervous that the whole field would run away from me. When that didn’t happen and I found myself in the middle of the pack by the mile mark, I just worked on moving my way up over the 2nd half. After a mad kick I finished 8th. Then the first year I ran at the NCAA XC championships as a sophomore (actually a redshirt freshman), I came in as our #7 runner, and really had no high expectations. I was hanging just inside of the top 100 for the first half of the race, when I saw our number 5 runner falling back in the pack. I knew right then that we needed someone to step up. I threw all caution to the wind, and just started passing as many people as I could. With a mile to go, I was so excited that I couldn’t even tell how tired I was. 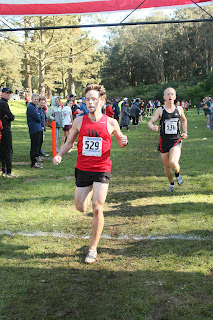 I finally started to tie up in the last 100 meters of the race, but I had moved up to 62nd place, which helped Stanford finish 2nd that year. My only regret is that nobody had our splits – I’d really like to know how fast that last mile was! 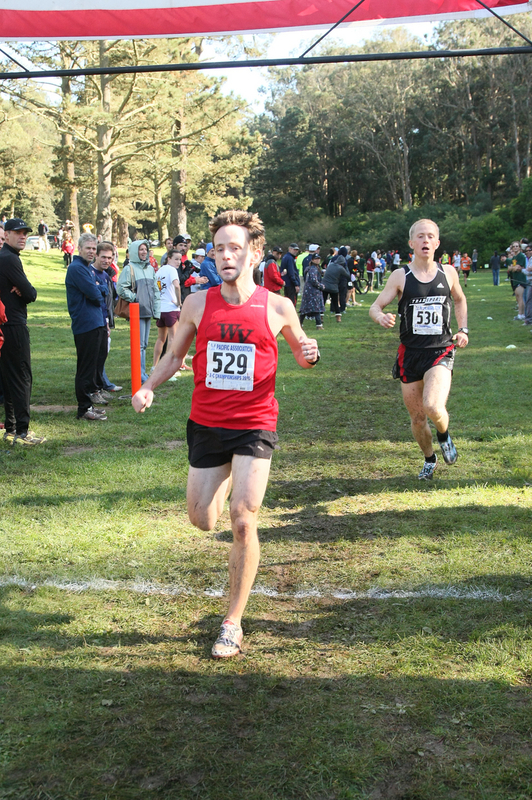 More recently, I was pretty thrilled with the Humboldt Half Marathon in October 2009. I had been struggling with both longer distance races and workouts. I wanted to run a good half marathon, but just didn’t have the pieces in place. Toward the end of the summer, I increased my mileage, and then added some longer tempos to my training. On the race day, I finally had the confidence that I could run 5:20 – 5:30 splits, and had the strength to hold it all the way to a 1:11:08 finish. LLD: You were a tremendous runner in high school. What do you think separated you from your peers back in the day? JG: First of all I really appreciate the complement. I was lucky to start my career in a very ideal situation. My parents were always very nurturing of my running without added additional pressure to perform. I was part of our Baylor team that was really on the rise, which included great coaches and teammates. As an 8th grader and freshman, I had you (Jeff) and the Anderson brothers to chase in practice and races, as we worked toward back-to-back team state titles. Even after the older runners graduated and I took over as the top runner, I always had people willing to help push me through workouts. Beyond that I really think a lot of luck was involved – I never got injured or had any serious setbacks. I enjoyed the training, which made working hard and staying focused feel very natural. Jamey in his accustomed position, out front. LLD: Do you have any advice for young runners who have the goal of becoming a state champion or get to Footlocker nationals? JG: I think goal setting is a very important aspect of a runner’s progression. I always had a couple of sets of goals – short term & longer term. A short term goal should be something that you are capable of achieving sometime between the next race and the end of the current season. They can be time based goals, or competition based – such as beating a rival for the first time or finishing in the top 10 of a league cross country meet. After you achieve one of these short term goals, think ahead to what your next goal is. Equally important are your longer term goals. These goals should be your reach goals – goals that will likely take a year or longer to accomplish. Entering my freshman year of high school I had already set winning the state cross country meet by my senior year as a long term goal. Since I was only our team’s number 3 or 4 runner for most the season, I was clearly a long way from achieving it. But having these long term goals to dream about while you knock off shorter term objectives can be extremely motivating. They’ll also help you avoid turning short term goals into mental barriers. The other key aspect is training – obviously. Anybody who’s ever worn a whistle around their neck will tell you that you need to work hard. A lot of times elite runners are asked about a key workout prior to a breakthrough performance. What is lost in that question is what you did in the months and years prior to that key workout. As you progress as a runner, your body is continuously adapting to handle the intensity and volume. So for most people to reach a high level, they have to train all year round. I would take two weeks off after cross country and another two after track, but I would train 11 months a year, 6-7 days a week. At times, I had to make sacrifices, but I used to joke that running was brushing my teeth – it was just part of my day. I do want to note that this wasn’t 11 months of high intensity training – sometimes you do need recovery – but there’s no other way to teach your body to be a runner, than to be running almost every day. LLD: When it comes to training, you seem to thrive on high intensity running. Where do you come down on the quantity/quality debate in training? JG: I’ve gone back and forth on this so many times over the years, and if I had the perfect answer I’d be a much better runner than I am right now. What I’ve become convinced of over the past couple of years is that variety & balance is the best approach. An “ah ha” moment for me was watching Kara Goucher run 4:33 to win the Millrose Mile in 2009 less than 3 months before finishing third at the Boston Marathon. I’m not a marathoner, but I had never heard people say that higher-end speedwork should be a key part of marathon training. Here you had Goucher running a world class mile just months before nearly pulling off the win at Boston. In my own running I’ve always liked running fast intervals – it’s something that comes pretty naturally to me. I never liked race pace training, I prefer faster intervals, so that race pace will feel easy. As I’ve gotten a little older, I’m finding that I can’t rely on interval training like I used to. Now the long runs and quality tempo runs are more important so that I’ll have the strength toward the end of races. My opinion is that all else being equal, runners should run as much mileage as possible. But that all else being equal part is how much volume should I run without getting injured, being frequently run down, and having the energy to handle quality workouts. LLD: From the very beginning of your competitive career, you've been a great racer. What are some of the things you think about when you race in order to run well? What advice would you give folks to improve their racing ability? JG: I’ve had times throughout my career where I raced very well, and frankly times when I raced very poorly relative to my fitness. I’ve often thought back and tried to remember what I was doing when I raced at my best. I’ve always been a very analytical type, but in a race, my brain can be my biggest enemy. That’s not to say I shouldn’t think about my pace, position in the race, and realistically how I’m feeling, but I think every bad race I’ve ever run, had one thing in common – excessive mid-race analysis. Racing is tough and painful, so I know the more I think about what’s going on, the more likely feelings of fear, doubt, and anxiety can hijack my performance. My best races are the ones where I can turn that internal monologue off and maintain a hyper-focus on running at that very moment of the race. Sometimes I have to tell myself – shut up and just run! LLD: What was it like running collegiately at a top notch program like Stanford? You were able to spend some time with some of the very best runners in the country. Were there any common denominators among those folks? Have any Gabe Jennings stories? JG: It was amazing running at Stanford during that era. It could be very tough at times individually because if I had a bad race or workout, I could see 10 teammates blow past me, but I wouldn’t trade the whole experience for anything. The cool thing about being teammates with all those guys is that there was no mystery to what it takes to be an All-American, NCAA champion, or an Olympian. I saw what it took every single day. From my freshman through senior year I was teammates with 7 distance runners who ultimately went to the Olympics – and that’s not even counting the women’s team, field events, and a coach. All of their stories were a little different, but I’d say the common denominator was their long term focus to achieving their goals. Jonathon Riley (2004 Olympian at 5000 meters) & I were roommates for two years. Jonathon never felt like he had to be a hero in any particular workout, but he trained so consistently hard. What I really remember about him, was how strongly he believed he was going to be one of the best – even if he was injured or struggling at the time. I honestly don’t think his brain was willing to compute anything else. I remember the day before a big 5000 meters on the track he told me “I’m nervous about the race – this is going to hurt really bad.” He ran right around 13:30 that day, second to Bernard Legat. I’ve had a lot of people ask me about Gabe Jennings. The two of us were polar opposites, but we were good friends all through college. I think a lot of exaggerations were written about him – he did in fact have running water growing up – but he was one of a kind. He’s probably the most passionate individual I’ve ever known, and certainly the most passionate runner. When I saw him win the Olympic Trials 1500 meter race in 2000, I jumped up and down on my broken foot without realizing it. The race was that awesome. Stories? I’m sure I could think of a quite a few… I remember one year he was trying to save money – or maybe be more in touch with nature – by living off campus. His idea of living off campus got pretty creative. One morning on I was on a run and saw Gabe walking in the foothills near campus. I said “Gabe what are you doing?” “Oh I’m uh, going for a walk.” Turns out he was camping out in a poison oak patch. Oops. LLD: Sometimes I think that it is hard for folks who have had success at the highest level of the sport, especially earlier in their careers, to continue running and competing. What keeps you out on the roads? Have your reasons for running changed through the years? JG: When I graduated from college, I was pretty burned out and ready to call it a career. Over the following years, I would still go for occasional runs – particularly when the weather was nice, but nothing I would call training. Just before I turned 30, I randomly met a guy who ran for a club in San Francisco. I thought it would be fun to go for a workout. It happened slowly, but I enjoyed the group I was training with, and embraced the challenge of getting back in shape. After a while I decided to start jumping into races, and I was hooked again. In high school and college, I felt like running was my life. If you asked me what I wanted to be when I grew up, it was a professional runner. Now there’s a lot more balance. I have my job, which I have worked hard at, and I’m married and look forward to starting a family down the road. Often now running takes a backseat to other priorities in my life – something that wouldn’t have happened before, but that's OK with me. I’ve really found the joy in running again, and made so many new friends through the running community in the San Francisco Bay Area. But don’t get me wrong, I still want to run fast! Jamey's still gettin' it done. LLD: Since this is a philosophy blog, there is a requisite philosophy question: I know you are a deeply religious person. What connections, if any, do you make between religion and your running? JG: That’s a great question – thanks for asking! Growing up in the church, people would talk about their walk with Christ. For me, I liked to think about my run with Christ. Having faith should be more than just going to church and trying to be a good person, it is about growing in your relationship with God. I think every religious person goes through periods of doubt and stagnation. Faith in God means believing in something that you can’t see and that at times feels very real, but other times does not at all. True faith is an ongoing journey to be closer to God, and to be a part of His work on earth – my run with Christ. I think a runner’s journey can be very similar. There are times when training feels great and races are going well. But every runner knows there are times when little seems to go well – you get tired, sick, injured, or just generally stuck in a rut. These times are as important as ever to find ways to press on, and not lose sight of your running goals. The times when I’ve felt faith in God, have given my run a higher purpose, and have given me a peace when I’m out on the trails and roads pounding out the miles. The most striking theme for me in the entire interview was "balance". Balance between short and long-term goals, balance between quantity and quality, balance between running and everything else. It's a constant struggle, and admittedly some are better at it than others, but I think it's something that most people miss in discussions, particularly when talking about training. Jamey does an excellent job of describing that balance, and how he maintains it. Well done. thanks, jeff & jamey. great interview - stories, info, all of it good stuff. thanks for taking the time. Thank you folks for commenting. And thanks to Jamey for putting so much thought into his answers. I read the post the day you forwarded it and just reread it. For me it is great insight into what you did and are doing. Even living with you through your first running career, I couldn't crawl into your mind and understand a lot of what was going on. Dad and I just tried to be there when you needed us and be patient with your pre-race pricklies. Thanks also to you, Jeff, for the thoughtful questions. A big key to being successful, especially as a high school runner, was having all you parents there. It really was a big family!! Thanks for your comments. Thanks for the comments! Scout - i appreciate your observation. It's funny because I considered each of Jeff's question on its own without thinking of an overall theme, but thanks for pointing that out. Jeff, thanks for letting me reflect on the many years I've been a runner. Keep up the good work with both your writing & your running! Mom, thanks so much for the years of support that you and dad gave me. I'm lucky to have amazing parents.